Tanah Lot Temple Bali, everything about Tanah Lot Bali - Indonesia, the best time to visit and experience the beautiful view of Tanah Lot sunset. Tanah Lot Temple Bali (Indonesian: Pura Tanah Lot) is a Hindu temple in Bali, Indonesia, which has a breathtaking natural splendor, it stands on solid sea rock overlooking the Indian ocean. 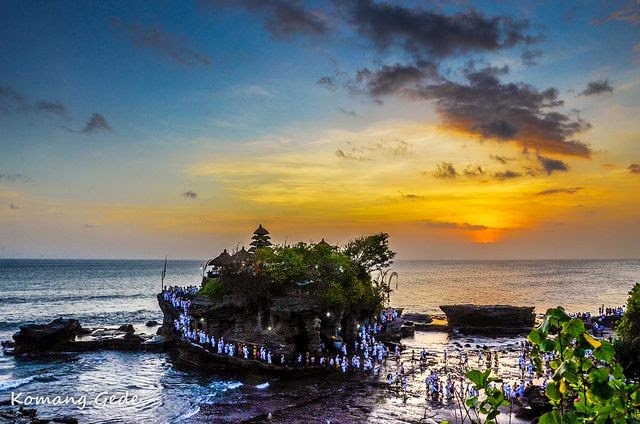 Tanah Lot is one of the best places to watch the sunset in Bali island and also it is the most visited tourist destinations in Bali, it can be seen from the number of visitors who visit the temple every day, even thousands to experience a beautiful Tanah Lot sunset. Tanah Lot Bali is also generally known as Bali temple in the sea as it appears like floating in the middle of the sea whenever high tide. Tanah lot Bali is a famous cultural masterpiece for photography. Tanah Lot temple is one of the very sacred temples in Bali island, and according to the legend, Tanah Lot Temple Bali is protected by holy sea snakes which were formed from the scarves of its founder. Pura Tanah Lot is situated on a large coral rock facing the Indian Ocean. Tanah Lot is a Hindu shrine built to worship the God in its manifestation as the God of the sea (God Baruna) to invoke prosperity and the balance of sea and earth. The History Tanah Lot Temple Bali closely related to the sacred journey from Blambangan (Java island) to Bali island of a holy monk called Dang Hyang Nirartha to spread the teachings of Hinduism, the people also call him Dang Hyang Dwijendra or Pedanda Sakti Wawu Rauh. The ruler of the island of Bali at that time was Raja Dalem Waturenggong around 16th century. In this area had been led by Bendesa Beraban Sakti who is ruler in Beraban village, then that's where Dang Hyang Nirartha stops and rest, after a few moments of rest and then came the fishermen who wanted to meet with him and bring a variety of offerings for him. On the evening before he went to rest, he gave teachings on religion, morals, and teachings of other virtues to the people who came to there, but Dang Hyang Nirartha presence was not favored by Bendesa Beraban Sakti because its teachings are not in accordance with the teachings propagated by Dang Hyang Nirartha, and this led Bendesa Beraban Sakti to become angry and invites his followers to expel Dang Hyang Nirartha of the region. Then, to protect himself from the aggression of Bendesa Beraban Sakti, DangHyang Nirartha moves Gili Beo to the sea and he created the snake from his shawl to always keep Gili Beo safe from malicious attacks. And after that moment Gili Beo changed its name to Tanah Lot (land in the sea). After seeing the miracle of Dang Hyang Nirartha, Bendesa Beraban Sakti finally succumbed and became a faithful follower of Him to teach Hinduism to the population, and for his services Dang Hyang Nirartha provide a Kris to Bendesa Beraban Sakti before continuing his journey (The Kris or Keris is a distinctive, asymmetrical dagger from Indonesia. Both a weapon and spiritual object, krises are often considered to possess magical powers. The earliest krises known were made around 1360 AD and most probably spread from the island of throughout Southeast Asia). Pakendungan Temple - situated on the west side, around 300 meters from Tanah Lot Temple. Pekendungan temple is the place where Dang Hyang Nirartha meditated once before and in this temple, the holy keris was given to Bendesa Beraban Sakti. 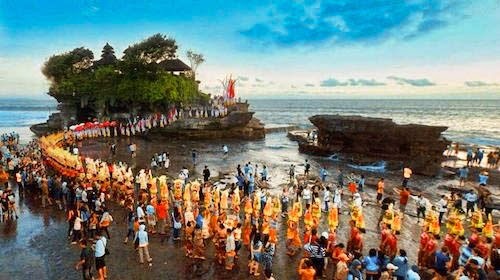 The ceremony Tanah Lot temple is held every 210 days (6 months) and according to the Balinese calendar, the anniversary of Tanah Lot temple is held on the Buda Wage Langkir, four days after Kuningan Day. Before entering the temple, the prayers must first pray at Beji Kaler, Beji Kaler is a sacred spring which is located just below the Tanah Lot temple, before the prayers go to the main temple they must pray in advance here and drink the holy water of this spring in order their souls to be cleaned and sanctified before entering and praying in the main temple. During the ritual in Tanah Lot temple, Balinese people would come to pray and even some of them also come from several regions in Indonesia. The festival will take place (nyejer) for 3 days. The uniqueness of Tanah Lot accompanied by local mythology associated with the holy snakes, the sacred serpents of Tanah Lot are believed to be the savior of the threat of crime and damage. 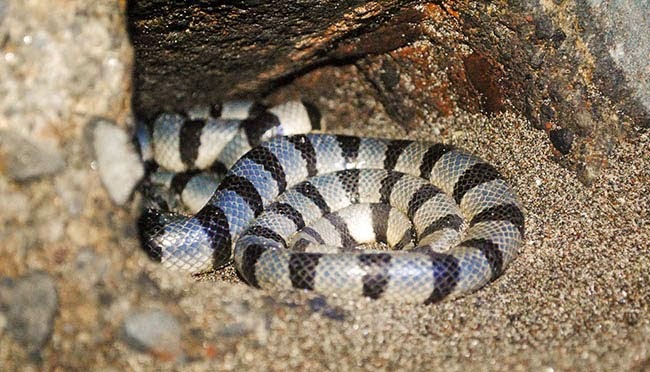 the scientific name of this snake is Bungarus Candidus, highly venomous sea snake that has a color such as black and white circular rings on its body. This sacred snake is believed to be the savior of Tanah Lot temple, this snake will attack those who would do damage at Tanah Lot temple but this snake remains docile and silent when in a cave on the edge of the rocks. Each visitor can even touch this snake without worrying counterattack of the snake and of course we will be accompanied by someone who understands the character of the snake. Another belief that adds elements to the mythological of holy snake of Tanah Lot is by touching it while praying then what we pray will come true, a mythology dependent we believe it or not. Tanah Lot is a very famous tourist destination in the world and it’s one of the best attractions in Bali island, every day Tanah Lot visited by thousands of visitors both domestic and foreign tourists. Very recommended and the best time to visit Tanah Lot is when the sunset time starting at around 4.00 PM until 7.00 PM. For those who love photography, at this time is the golden hour or magic hour and if the weather is good we can capture an amazing sunset and enjoy unforgettable spectacular and astonishing sundown sight. Visitors can stay close and walk beside the temple when low tide but it's not recommended and too dangerous when high tide. Tanah Lot is very suitable to serve as a family holiday and also there are adequate facilities such as hotels, restaurants, sunset terrace, Tanah Lot cultural park, art shops, parking area, emergency facilities, security facilities, toilets, rest area, and information center. The Tanah Lot information is also available in any Bali travel guide books or online listings, so to reach this attraction is very easy.